With more than three decades of RF welding experience, you can count on MarkPeri to provide advanced RF tooling solutions for medical IV fluid bag manufacturing applications. We are proud to sell turnkey systems and stand-alone tooling for all RF machines, including medical tube weld nests and mandrels for medical tube sealing. We also have the expertise to help you choose the most appropriate RF tooling for your specific RF bag sealing technique and equipment. We specialize in complex medical tooling and will verify all tooling works to your satisfaction prior to shipping it. At MarkPeri, we’re passionate about providing the best customer service and making your RF tooling purchasing experience as smooth and seamless as possible. Contact us to learn more about our RF tool solutions for the medical industry and how they can benefit your operation. Radio frequency (RF) welding/sealing is an essential process in the manufacturing of products for the medical industry such as the intravenous (IV) fluid bags used to collect blood, urine and other bodily fluids. RF sealing entails the creation of radio frequency waves to generate heat that welds two or more layers of plastic film together. The molecular action produced by the RF waves is akin to cooking food in a microwave oven. Effective RF welding relies upon the use of appropriate techniques and equipment, along with high-performing RF tooling, to ensure the finished product contains a strong seal. 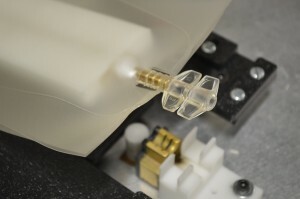 Tube/mandrel sealing is a common technique when manufacturing IV bags. This RF tooling-based process involves welding the IV bag’s insertion tube between two plastic film layers to create a tight seal around the perimeter of the flexible container, as well as the tube weld within the perimeter. The use of tubes requires double-cycle tooling that includes mandrels. 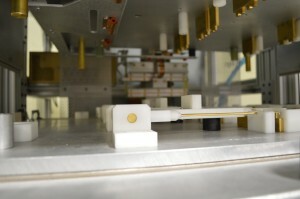 In mandrel RF welding applications, the tubing slides over a mandrel and is positioned between the two plastic layers. The plastic material is then placed between the upper and lower dies of the sealing machine. The application of heat generated by the RF waves and pressure created by the die results in the fusing of the two plastic layers. Radio frequency tools typically used for the RF sealing process of medical bags include a brass upper die affixed to an aluminum tool and jig plate, and a lower weld nest constructed from aluminum. The weld nest normally contains a buffer board attached to the seal area. The buffer board helps prevent heat-sinking of the metal nest, while also providing an insulated landing spot for tear-seal tool edges. Key considerations in RF tooling include ensuring that uniform thickness is maintained, as well as the removal of any sharp edges or corners. It is also imperative to determine the appropriate level of RF energy that is fed into the seal area. Using RF sealing equipment that contains a generator with a high-quality arc suppressor will help regulate the voltage output by stopping the output before damage to the plastic film or die can occur. This will also ensure the temperature does not drop to a level that is insufficient for sealing to take place.